As if family life isn’t challenging enough, Manhattanite Colin Beavan takes it to the ultimate test when he decides to embark on an experiment to see if leading a life with zero environmental impact affects happiness. To make it work, however, his coffee- and shopping-addicted wife and their toddler have to join his quest. The film, which screens at the Walker September 16th (did I mention it’s FREE?!) follows this life-changing adventure as the family adapts to their new lifestyle, the couple struggles with their marriage, and the criticisms fly after Beavan’s many media appearances. Co-director of No Impact Man, Laura Gabbert graciously answered some questions about the making of the film while visiting with family in Minneapolis. Colin’s wife, Michelle Conlin is an old friend I grew up with in Minneapolis. I knew Colin was embarking on this experience early on so my filmmaking partners and I asked him if we could make a film about it. What made you think this would be a good documentary? Colin’s project was interesting to me as a filmmaker because it was a character-driven, solution-based approach to the environmental crisis. As we embarked on the filmmaking, we were excited by the immediacy and the intimacy of observing one family attempting to make these changes in their lives. How did you convince Michelle and Colin to let you make a documentary film of No Impact Man (NIM)? Michelle was game from the beginning. She’s a journalist and knew it would be good for the project. 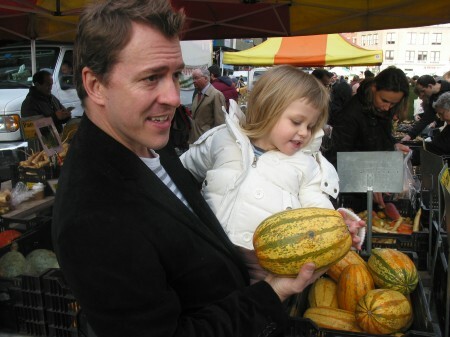 Colin was leary of a documentary crew following him around and observing his family life, but eventually he agreed that a documentary film could explore different dimensions of the project than his book. When did the filming begin and can you give a sense of how much time you spent with the family over the year? NIM began in November 2006, and we started filming about one week into the project. Justin Schein (co-director/cinematographer), who is based in Brooklyn, was there twice a week for shooting. I made regular visits to New York (from L.A.) 6 to 7 times over the year, and I slept on Michelle and Colin’s sofa each time so that I could shoot them late at night or first thing in the morning. We followed the Beavan/Conlins for the entire year and for about six months after the project ended. Can you explain how you and Justin adapted your filmmaking to reduce your footprint? Colin requested we make as green a film as possible. Documentary filmmaking already has less environmental impact than a Hollywood production. I had to reduce my air travel in half. Since the film was shot in NY and edited in LA we used the internet to send cuts back and forth. In NY no cars or lights were used, and all tracking shots of the Beavans riding a bicycle were done from a bike. The filming was all local since the Beavans didn’t travel. Justin decided to use the old DV camera he had instead of purchasing a new HD one, and he used 4 rechargeable batteries all year long. Six months into the project when the Beavans turned off their electricity, we shot only with natural light. We went with a grainy look as our subjects lived by candlelight. Do you think you’ll try to incorporate these practices into future projects? Definitely. There are new environmental codes for fiction and nonfiction filmmaking and technology is making it much easier to be green. Did you ever think Colin and Michelle would reach a breaking point? The publicity explosion around the experiment was the most challenging thing for Colin and Michelle, especially after the NY Times article came out (“The Year Without Toilet Paper” March 2007). Colin was inundated with requests by the press and this started getting in the way of the experiment. Colin was thrust into the position of being a spokesperson for the environmental movement and this was a surprise and challenge for him at first. (Although since the NIM year, he’s become a prolific educator and public speaker.) Colin and Michelle each had their ups and downs during the course of the year. Half way through the year Michelle had what she calls a “conversion experience” and began to feel more motivated politically as she began to see the positive effects the experiment was having on her health and her family. How did you see the Beavan/Conlin family evolve over the course of the year? By stripping away things like shopping and entertainment they got back to the basics of spending time with one another, they rediscovered things they had lost. It was the Walden side of the experiment. It made them healthier and happier. They focused inward a little more. Paradoxically, they also became more engaged in environmental issues in their community. They became more engaged politically. One of the ideas behind the Walker’s Raising Creative Kids initiative is that parents are key models in developing their children’s creativity. Certainly the NIM year must have forced Colin and Michelle to think outside the box when it came to parenting. Can you comment on the creative aspect of their family life during NIM? They spent a lot more time together as a family and a lot more time out exploring the city. Because they had no light or electricity in their apartment, it forced them outside and they embraced the city in ways they hadn’t previously. They biked everywhere in the summer and spent evenings along the Hudson River and in their community garden. Because one of the rules of the experiment was “not buying anything new”, in order to buy their three year old daughter Christmas presents, they shopped at their local consignment and second-hand children’s stores. There was a great post in Colin’s NIM blog related to this idea of what to do without TV. How has NIM changed you and your family’s lifestyle? A lot of this stuff just makes sense to kids–composting, for example. When Colin challenged us to make changes in our own lives, this was something my family adopted. My kids (an 8 yr. old and a 5 yr. old) intuitively understood composting and they got a kick out of it. If someone at our house tries to throw vegetable scraps in the garbage, my kids are there to correct them. We’ve started a vegetable garden, and the kids enjoy seeing where their vegetables come from and harvesting and eating their own produce. We do our best to carpool, which is challenging in L.A., and we participate in local environmental organizations such as Tree People’s tree plantings around the city. Do Colin, Michelle, and Isabella continue to live according to the same rules of the NIM year? Have any allowances been made for the sake of convenience? They’re low impact now as opposed to no impact. There’s still no air conditioning, but air travel is allowed, and they share a plot at the community garden. Their main mode of transportation is their bicycles, but if it’s raining or snowing, they’ll take the subway. They’re not nearly as strict, but definitely more mindful about their choices. NIM was a full-time job…to make your own bread every week and do your laundry by hand only works if one adult in the family doesn’t need to be at the office from 9–5 (Michelle maintained her job at BusinessWeek throughout NIM). What they learned is that it’s pretty easy to reduce your impact by 75%, but it’s the last 25% that’s really hard. There are several. Habeas at the Gate, a narrative film based on a friendship between a Guatanamo detainee and his Park Avenue lawyer, and The F Word, a documentary about the state of feminism today. Thanks Laura. I can’t wait to see No Impact Man when it screens at the Walker! I’m excited the Walker is screening it. I actually took art and dance classes at the Walker when I was a child. No Impact Man makes its Minneapolis premiere at the Walker’s Cinema on Wednesday, September 16, 7:30 pm before opening at the Lagoon Cinema on October 2nd. The Walker screening is free and will be introduced by co-director, Laura Gabbert. 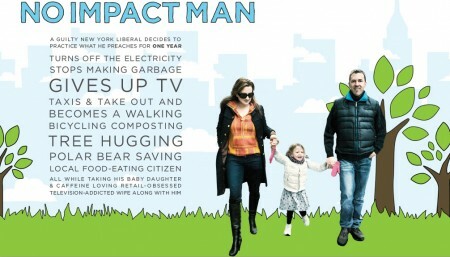 Colin Beavan’s book, No Impact Man The Adventures of a Guilty Liberal Who Attempts to Save the Planet, and the Discoveries He Makes About Himself and Our Way of Life in the Process hits shelves in September and you can read his daily posts on the No Impact Man blog.